Jesus compared humans to sheep. I always pictured that verse with pathetic, fluffy sheep, helpless and victimized by predators, unable to find food or water for themselves. That was before I found out what shepherd-less sheep are really like. 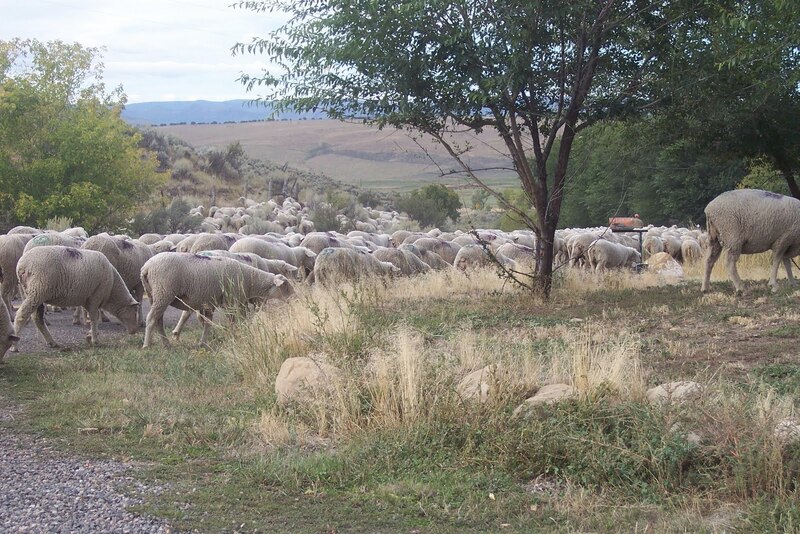 Every spring, local flocks are herded into the high country and left behind to graze and grow all summer long. For months they fend for themselves, without benefit of a shepherd or a sheepdog. In early fall, before the snow flies, the flocks are brought down into the valleys to spend the winter. 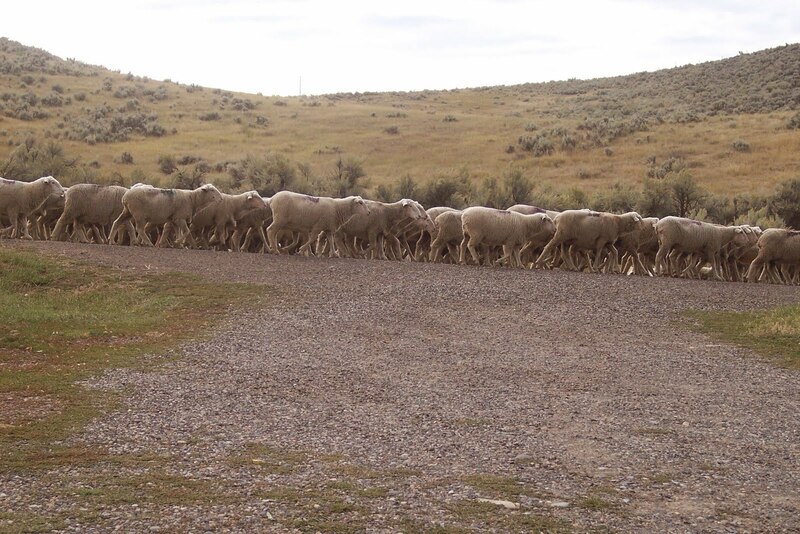 It's these "wild" sheep that are used in our sheepdog trials. These undomesticated sheep will literally turn on the dogs sent to gather them. They don't just run away either, they'll turn on the dogs and kick at them, even try to bite them. Sometimes the dogs, who've never experienced biting, kicking sheep, are so demoralized by the experience they just turn tail and run away. These sheep are neither friendly nor fluffy. Their wool is matted and full of burrs and ticks. They have their own hierarchy of leadership, based on the survival of the fittest. As far as they are concerned, they don't need a shepherd, or a sheepdog... In my opinion, these are the kind of sheep to whom Jesus was referring. These are the ones He was sent to reach with His message of love and good news. You see, those sheep, convinced as they are in their little sheep brains that they are perfectly capable of taking care of themselves, really do need to submit to the shepherd for their health and safety. They might be able to manage on their own in the summer, when food is abundant and the livin' is easy, but they wouldn't survive the harsh, cold winter on their own. Each of us has a wild sheep hair or two... It might take the form of pride, personality, or position in life, but we all have some area(s) where we are convinced we can fend for ourselves. The clue? When someone in authority in that area tries to provide guidance or direction and you kick and bite at them, whether it's your pastor, publisher, or parent, that's an indication you've got a touch of wild sheep syndrome! What's wrong with being a wild sheep, you ask? At worst, you'll bond with others of like kind to rebel and resist, and lead others astray. Everything will take twice as along to accomplish. You'll resist the very things available to you through submission to the shepherd that would greatly improve your quality of life. The shepherd has your best interests at heart. Are you a wild sheep? A sheep without a shepherd, running amok? In what areas of life do you find it hard to submit to the authority/leadership of another? Great post. I have never thought of this before. I have very minimal knowledge of sheep, so this was eye-opening. I love this new perspective. Thanks so much for sharing, Niki. I will be mulling this over for a long time. Interesting. I don't know that there's a specific area in my life that I have a hard time submitting, but I do know that if I don't respect a leader, I probably won't listen to what they tell me. I do think it's important to understand the difference between submission and obedience. At the end of the day, I obey God to the utmost of my ability--he is the good shepherd--and submit to human leaders only as they stay in line with God's will. I know in my small church, if I sumbitted to all of the requests and recommendations that come from authorities, I would be overworked and stressed out. On the other hand, if my pastor or parents give me a direct order, I take that very seriously. In the case of my husband, his dominant middle-eastern personality is such that he barks orders without even thinking. I don't "submit" to those. I tell him to stop bossing me around and treat me like an adult. If after long discussion and prayer we can't come to agreement on an issue, then I would submit to him as head of the home, but only then. So, I think this can be a sensitive subject. Some people expect wives, parishoners, etc... to become doormats in the name of Biblical submission to authority, and as Wenda pointed out last week, this can lead to abuses. Although, I love the sheep analogy. I'm sure there's a lot to be learned there. I will be thinking about it for a while. Great analogy, Niki. I love the pictures, too. You know, I don't like to admit this, because it's not really what people who know me see in me, but...I just absolutely can't stand being told what to do. It makes me stubborn and irritable and kind of like those wild sheep. And in that, I see the truth in your statement, "Everything will take twice as long to accomplish." You're so right. I really need to work on this. Oh, I really don't like admitting this. Dina, submission is practically a four-letter word for most folks, esp. women! Probably because it has been confused with some kind of blind, zombie-like obedience, but that's not submission at all. The way I was taught is that submission comes from MY heart and is an act of my will. It's not forced on me or demanded by a leader or authority figure (that is tyranny and abuse of power, and describes what Wenda posted on last week). When I choose to submit - come under the mission of - a godly leader, I come underneath the protection of that leader's authority and responsibility. In the case of my husband (they all tend to bark sometimes, don't they?) as the head of the household he is the responsible party. If something goes awry, he is the one left holding the bag, not me. That understanding pushed him into a greater place of prayer, seeking God's will, and being open to and asking for my counsel. As a leader, there is nothing more valuable or precious than a person who has chosen to come underneath your God-given mission and work together with you to accomplish that goal! Suzie, I have the same challenge with those "mandatory" demands, primarily when I don't understand the "mission" I'm supposed to be submitting to, or when I don't trust/respect the one giving the orders. I try not to be one of those sheep who has to have everything explained, but it sure helps when I know why we're doing something I don't fully comprehend! Niki, what a great post. You had me at "Babe," LOL. Love that movie. I had no idea about the wild sheep. I always tend to think of them as stupid, mindless things. I definitely have a wild sheep streak in me. I am fully aware of a few areas where my first instinct is pride and a fight. I'm sure there are more areas, and I pray that God helps me tame these wild parts of myself. I'm so glad you gave us an example of wild-range sheep, because I too think of domestic herds. Your post and the subsequent comments give me a lot to think about. I'm too tired to do more than say nicely done! That's fascinating! I didn't even know that and my aunt and uncle in Pa. started raising sheep several years ago. But I guess because they are not considered wild is why I'm naive. Those pics of the sheep and the dog are really amazing. Like Susie I have more than one wild sheep streak in me. Although I always thought of them more as donkeys. :) Hey, maybe the term 'stubborn streak' comes from those sheep. Baaaaaaah. Couldn't resist. Thanks Niki. I loved this. We had four of them and twice a day I'd go out to feed them. They'd line up against the fence and sing for their hay. No kidding! Except every single time, three of them would start and then the fourth one would join in but on a higher note than the rest. It was so funny and precious. I wish I'd recorded them. Anita, I love the mental picture of sheep singing for their supper! We had a couple of goats for awhile who liked to stare at us through the window. Creepy. Ditto on "Babe," Susie! At some point I'll post about the sheepdogs, who are amazing animals in their own right. The dog handlers who come here for the trials say the sheep here are the meanest, wildest sheep they've ever encountered anywhere in the world. Niki, great post! I had no idea sheep could become so wild and vicious. Thanks for your challenging and thought provoking analogy. Thanks Narelle! I imagine you've seen your fair share of sheep and shepherds, too, even if they aren't the wild kind! Australia is our main competitor for wool and mutton exports. Very insightful. I'll preach that passage about sheep a little differently now. Good job. Thank you, Warren! God bless!